The above video is about my book Evo-illusion, now available on Amazon. The URL for my book is www.Evo-illusion.com. The following sub-pages are debates that I’ve had with very highly educated evo-illusionists. I have frequently been asked what happens when I debate Ph.D. biologists and the like. The people who ask this are usually people who think I couldn’t possibly fare well against highly educated evo-illusionists. So here is a sample. You can judge for yourself if you think they are capable of beating me in a debate. The common denominator of all of the many evo-illusionist debaters that I encountered, no matter what their education, is that they all find it necessary to demean the questioner; which in these cases is me. The demeaning usually begins as soon as they realize they are getting their butts kicked in the debate. When I first started writing this blog, I naively thought that biologists and biochemists would be interested in facts that would disprove evolution. I actually thought that scientists were objective and interested in new ideas. In the case of ev-illusionists, that certainly is not the case. Every one of the debaters believed what they defended so vociferously they were unable to see how absurd their stance really was. They spouted information to their students, family, and people that they were in charge of, who also believed the illusion. This is, in a sense, a perfect example of evolution. Once layer after layer, generation after generation, believed the illusion, it became a locked-in science. In reality, we are not arguing science here, we are debating religious belief. We are debating atheism. Atheism is a religious belief just as certainly as is Christianity or Islam. In reality, these highly educated debaters are defending their religious position, and are not interested in logic, common sense, and probabilities. They have no interest in objectivity and true science. They have swallowed the illusion hook, line and sinker, and their minds cannot and will not be changed. And they will demean anyone who tries; like me. They then pass the indoctrination they have suffered on to their students, as most of these people I debate are university professors and instructors. Atheism completely depends on evolution for its existence. Interestingly, evolution does not depend on atheism. Many Christians believe that God used evolution as a tool to create life and species. Virtually all knowledgeable atheists must believe in random mutations and natural selection as the cause of us, life and species. Without evolution, there is no atheism. Just as in Christianity, the god and creator of all of living nature in atheism is a trinity: Time, Random Mutations, and Natural Selection. when ever I ask question about evolution on amazon forums they view me as anti science. In post I never said that model evolution was wrong I just ask a question. But evolutionist see any one that questions evolution is anti science. Nothing can be further form the truth. In science we should ask questions all the time to get at the truth. Have to diasgree with you on the origin of evolution-fanaticism, at least speaking for myself only. You seem to imply that it’s all about following authority figures. Perhaps in some cases. For me it was fear of hell. I was raised Catholic and was devout until late high school, when the ridiculousness of some of Church doctrines became too much and I gave up the faith. Very soon after giving up the faith, I found myself on discussion boards vociferously debating against religion and debating for evolution. Looking back on it, the true motivation was my fear of hell. I was trying desperately to convince MYSELF that the universe was completely unintelligent and thus there could not possibly be any true meaning to life and therefore I could not possibly be held “cosmically” responsible for my behavior. Please note, I am not a hell-believer. The whole doctrine of hell stinks of propaganda aimed at control. But this does not change the fact that fear of hell, or in a looser sense fear of responsibility, is what was driving my intense dogmatic debate behavior on the message boards. In fact, looking back on those religious debates makes me giggle a bit. It’s those who are desperately afraid there might not be a god versus those who are desperately afraid that there might actually be one. The desperation results in dogma as a defense mechanism, so it’s dogma versus dogma. And they both accurately portray each other as dogmatic, because projection is what we humans do best. Your story is like mine. I was in fear of the notion that there “might be a hell, so why not believe” for most of my teen years. When, as a child, you are indoctrinated into a religion, your brain is not fully matured. The most absurd notions can be believed. When I got to college I escaped what I had been taught for so long but questioned do deeply. Evolution was my out. My answer, just like yours. I had such a free feeling when I realized the answer wasn’t the religion that I had been taught but didn’t really accept. I felt so enlightened. At last! And, like you, I became a pretty adamant pro-evolution arguer. I wanted other people to have the same enlightenment that I was now so fortunate to have. Until I got my second enlightenment. Which was just as much fun as my first, amazingly. I didn’t actually bug people with evolution, but if asked, I did freely discussed if pressed. The other entity that keeps evolution going is the power it gives believers. Just imagine that you finally KNOW how all of nature formed. For sure! It gives you a certain strength that other “gullible” and now “inferior” people don’t have. It is very empowering. And I felt empowered. And smart! So nice to see I am not alone…..and, you are right on. They have to attack me personally. They fail so badly at attempting to attack the information on this site. If I was a fifth grader with this site, it wouldn’t make a lick of difference. The objective facts presented trump the presenter. And since they can’t answer those, I personally have become the target. Which I find amusing. Doesn’t bother me a bit. It’s actually fun to see how much time evos will waste trashing lil ole me! Over and over…. Thanks for the visit and great comments. I spent some time on the Free and Rational Discussion Board (www.freeratio.org) debating evolutionists. My objective was a bit different than yours. I did not expect to persuade anyone toward skepticism of Darwinism, but I wanted to see if my arguments would hold up, and possibly learn something. I figured I would learn more about evolution on an evolution oriented site, than a creationist one. I did not respond to personal attacks, and told them that I would not. Indeed, it is against their site policy, and they do have monitors to discourage it. Nevertheless, they were pervasive. I simply stuck to discussing the topic, and would only respond to those that had something to say. One problem with all of this is that it can be quite time consuming, especially if you attempt to respond to the ten or twenty posters who want to get their oar in. As you noted, though, I loved your comment that the odds of 20:1 weren’t fair, for them! Considering the case they are trying to make, you are so right! My other favorite thread was the one I opened on abiogenesis – life from chemicals. I figured it would be like shooting fish in a barrel. Yup. There were times when some of the posters learned something that they would have preferred not to. I observed that even the contents of a single cell is not understood. How could you believe it could form from random reactions, if you don’t even know what is in it? This solicited a great deal of skepticism, even after I quoted from Neil Shubin’s “Your Inner Fish”, where he makes the same point (that the cell is not well understood). Besides being accused of quote mining, at least one poster started dumping on poor Neil as an inadequate authority. At last one of their more educated posters admitted this was so. One poster pointed me to a lengthy paper describing how life could have started with RNA. This is the latest darling of abiogenesis, because RNA is viewed as an easier starting point than DNA. I don’t think the poster expected me to actually read the article and take it apart point by point, although he did hang with me for a long time. I pointed out that it merely discussed nine independent islands of research that had no way of interconnecting, other than random chance. Therefore, his belief in abiogenesis was an act of faith, nine times no less. This is not well received by evolutionists, who know what happens to any path that is subject to random chance. Someone, like you did with hemoglobin, will point out that there is not enough matter or time in the universe to make that particular leap. Their security blanket for this kind of thing is to say that science doesn’t know the answer to that YET. So, all their beliefs are provided by science, or will be, some day. Hence their own beliefs are not based on faith, but on confidence in what science will ultimately show. Do they have a time limit for this kind of thing? That would show a lack of faith, so, no. The screening at evo-forums is always only for evo-skeptics, as you found out. I went 330 pages at rationalskepticism.org. I was warned numerous times, and blocked for weeks at a time for my very respectful and tame discussions, when the evos were allowed to be as asinine and rude as you could imagine without any warning whatsoever. They finally gave me a lifetime ban which is really great. I wasted too much time there talking to the clones who are so unbelievably indoctrinated there is absolutely no hope of even having a semi-intelligent discussion. It’s interesting to check the other threads, and see how these clones say the exact same very rude stuff, over and over, like programmed robots. A very funny “science”, this evolution. Can you imagine astronomers or physicists discussing like that? I am just checking in to see what is new on your website, and to check your boxes to notify me of new comments or posts via e-mail. Thanks for all you do here. I really like it, and found out about you through your debate on rational skepticism, which was a hoot! Hey thanks! Nice to hear some positives. I was banned for life from ratskep. That’s how they win debates. Hello Steve, I have been looking for a site like yours for a while and I am very grateful that you’ve gone to the extent that you have in examining the evidence for evolution vs intelligent design. Is this site still active? Are you working on another book? By the way how do I get a copy of your book? The Amazon link to your book is dead. Thanks for the visit. Yes, this site is still active. It’s pretty big, so I don’t want to overwhelm people too much. But when I see a good article or subject, I do add. 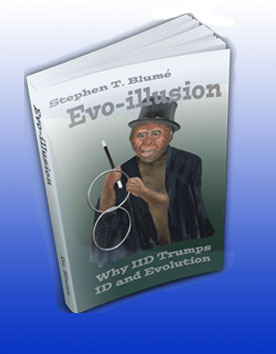 If you go to Amazon, and type Evo-illusion you will find my book. I am just wrapping up book 2, which is titled The Evo-illusion of Man. It was a pretty astounding book to write, and I hope a good read. I didn’t have enough room in book 1 for ape-man evo, ergo, book 2. Let me know if you have any problems with Amazon. You do realize that if tomorrow you actually demonstrated that evolution was wrong, it wouldn’t get you one single step closer to proving your god is real, right? I don’t have a god. You assume too much. My point is we have absolutely no idea what the source of life and universe is. But we can sure make up some incredible fables to try to explain. If you choose to not call this a god, that’s your right I suppose. But that’s what it is. Meanwhile, do you believe you have the same genetics as your parents? Or slightly different? If you came to discuss you are welcome here. But please make your questions intelligent. Don’t waste my time with a question like that. There is a big difference between a scientific creator source and a religious god that you talk to, with books and churches and… There has to be an intelligence in the universe somewhere. The evidence for that is overwhelming. Go watch a vid on DNA transcription/translation and tell me that’s created by dumb luck. I am not religious. I have no idea what that source is. So could be aliens or something? Uber-gigantic time traveling super bastards? Sure. Super bastards. Are you generally ruling them out, or keeping them in consideration? And I’m not trying to play a “gotcha” game, I’m literally trying to probe your beliefs and thought processes. You called me on the god thing, so I wanna know where you’re at, actually.